Activities During Boarding School Varsity Soft Ball, JV Ski alpine team, drama club. Hebron Academy was my home for 2 years and completely changed me as a person! During my time at Hebron Academy I was able to find myself, improve my academics tremendously going from an average student to actually reaching the honor roll before graduating. I not only hope to be able to send my own children there for High School but hope that people that read this will understand how dedicated the people are at Hebron Academy. I don't want to call then staff because it's more than that...they are your family! I know it sounds cheesy but my two years at Hebron Academy has changed me as a person in a positive way and I feel has made me the person I am today. I feel that I'm able to give my children a better insight into studying, and other ways to approach their academic life along with their friendships because of Hebron Academy. 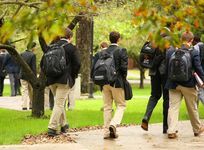 Anyone coming into a boarding school may feel overwhelmed because there are people that have been friends there for years but what I learned very quickly was that they will welcome you with open arms. Come into the experience with an open heart and open mind and you will leave with the best experience of your life. Truly the experiences Unity and memories that I will have for the rest of my life. My academics have made it so that I can do whatever it is I want to do in life. Being a girl I can obviously only really recommend the girls dorm. However, no matter where you are on that campus you're a family. My favorite spot was sitting in the bowl at night with friends looking up at the sky at the beautiful stars and just talking. What I liked most about the opportunity at Hebron Academy is the small class sizes, structure, and availability of the teachers to help you if you were struggling.There were many a nights we would huddle together going over Shakespeare in the teacher/dorm parents on campus apartment getting it right! What I liked about Hebron was that you needed to choose an activity. It didn't have to necessarily be a sport as I did drama one semester however pushing for the participation gave me insight, memories, an amazing sense of accomplishment when I was pushed in my skiing! People look at mandatory participation and feel it's a bad thing I feel like it made me a better person. There's such a diverse availability of things to choose I feel that each person has a place and it no longer feels like it's mandatory. I loved that they had the drama music and arts I participated and drama and took art classes and have loved music art and Theatre ever since. Just like any other school there's extracurricular activities outside of sports. I was not a part of them but had many friends that were they had the opportunity to take people around to show them the campus and really give them an idea of what Hebron Academy is like from the students point of view. I loved the unity, feeling as though I had 40 some-odd sisters! We loved each other, disagreed with each other, shared things... memories... clothes... make-up, laughed, cried, watched movies... everything you would expect at home! I was home sick when I first started my dorm parent at the time I knew how I was feeling brought me cookies, hot chocolate and a big hug. The quality of the food was good far better than my brother's boarding school. Plenty of options. You were able to sit with your friends, dorm parents, teachers...it was like having a dining room table in a large room. Hebron Academy is a small town... But you always had the post office so you can get your mail from home. There are trips that you could take into Portland to do your shopping on the weekends plenty of things to do. Social life at school was far better than anything I could have imagined. I have friends today from all over the country, and other countries such as Spain, that I will have for life. There are never cliques... yes people have friends in circles but you're never not welcome or feel bullied.